Here's an idea you can keep in mind the next time you breakout the box of Cheerios. 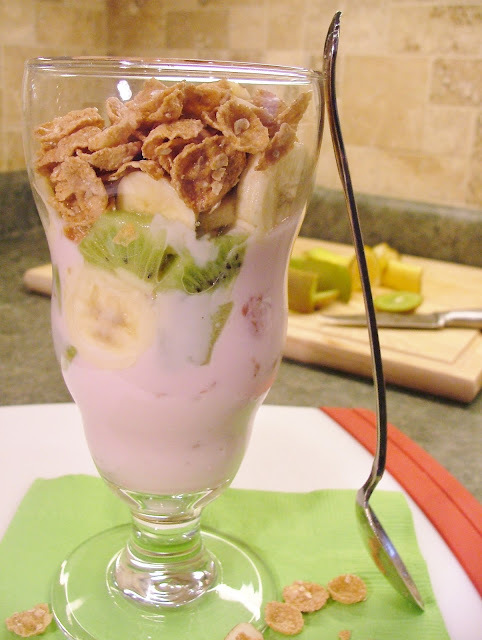 Instead of pouring milk on your cereal, how about pouring your cereal on top of low-fat yogurt and fresh fruit? Something like...oh I don't know...Almond Oatmeal Crisp cereal on top of sliced kiwis, bananas and low-fat strawberry yogurt. This little breakfast wonder left me feeling fuller WAY longer than my usual bowl of cereal which was a nice change because I didn't end up craving multiple morning snacks. I was also thinking that if I had co-workers, it would be much more exciting to tell them I had a Strawberry Kiwi Banana Parfait for breakfast instead of just saying cereal and milk. I thought I would also pass along this short video (1 minute and 10 seconds to be exact) I posted on YouTube. It's about how to peel a kiwi quickly using a spoon. I know I used to struggle with peeling the slippery kiwi until I was shown how to do this. Hope it helps! Spoon half the yogurt in a glass. Top with half the kiwi, banana and cereal. Repeat with the remaining yogurt, kiwi, banana and cereal. If you like what you see, join the newsletter for free access to exclusive recipes, cooking tips and first dibs on notifications and giveaways! I'm always looking for new breakfast recipes that keep me full for hours! I often put granola in my yogurt, but haven't thought to use cereal. The video is super helpful! Thanks for your comment and feedback Chelsea. Happy to hear you found video helpful!